One of the constellations. The Septuagint translates "Kesil" in Isa. xiii. 10 and Job xxxviii. 31 by "Orion"; the Targum renders it in these two passages and in Job ix. 9 by "Nefila" (lit. "giant"), while the Peshiṭta in Amos v. 8, Job ix. 9 and xxxviii. 31 uses "Gabbara" (lit. "hero"), both of which names likewise denote "Orion." There are therefore four references to this planet in the Bible. 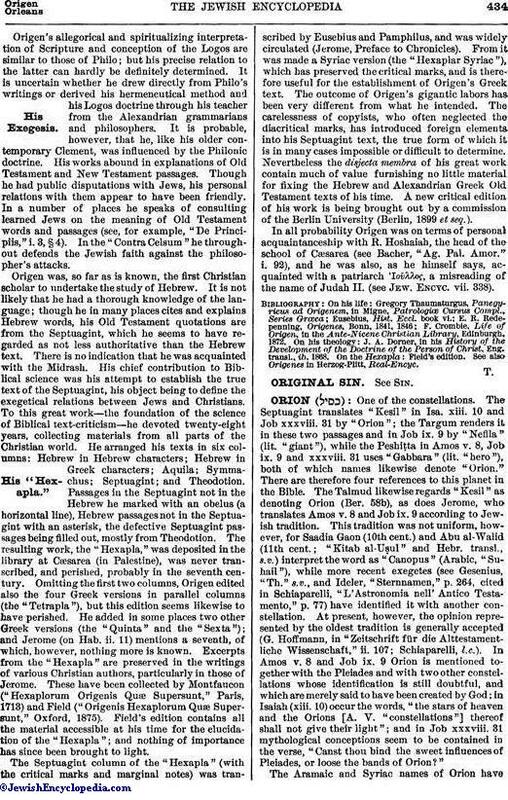 The Talmud likewise regards "Kesil" as denoting Orion (Ber. 58b), as does Jerome, who translates Amos v. 8 and Job ix. 9 according to Jewish tradition. This tradition was not uniform, however, for Saadia Gaon (10th cent.) and Abu al-Walid (11th cent. ; "Kitab al-Uṣul" and Hebr. transl., s.v.) interpret the word as "Canopus" (Arabic, "Suhail"), while more recent exegetes (see Gesenius, "Th." s.v., and Ideler, "Sternnamen," p. 264, cited in Schiaparelli, "L'Astronomia nell' Antico Testamento," p. 77) have identified it with another constellation. At present, however, the opinion represented by the oldest tradition is generally accepted (G. Hoffmann, in "Zeitschrift für die Alttestamentliche Wissenschaft," ii. 107; Schiaparelli, l.c.). In Amos v. 8 and Job ix. 9 Orion is mentioned together with the Pleiades and with two other constellations whose identification is still doubtful, and which are merely said to have been created by God; in Isaiah (xiii. 10) occur the words, "the stars of heaven and the Orions [A. V. "constellations"] thereof shall not give their light"; and in Job xxxviii. 31 mythological conceptions seem to be contained in the verse, "Canst thou bind the sweet influences of Pleiades, or loose the bands of Orion?" The Aramaic and Syriac names of Orion havebeen connected with the ancient Oriental tradition that Nimrod, who is called in the Bible a hero and mighty hunter, was fettered by God for his obstinacy in building the tower of Babel, and was set in the sky (Winer, "B. R." ii. 157). It is possible that the ancient Hebrews saw in this constellation the figure of a man who was naturally regarded as extraordinarily tall and strong, exactly as the Greeks named it "Orion," the Egyptians "Sahu," and the ancient Hindus "Triçanka" (Schiaparelli, l.c.). The Targum to Job xxxviii. 31 speaks of the "bands which lead Orion." The Babylonian scribe and physician Samuel (d. 257), who was celebrated also as an astronomer, said: "If a comet should pass over Orion the world would perish" (Bab. Ber. 58b; Yer. Ber. 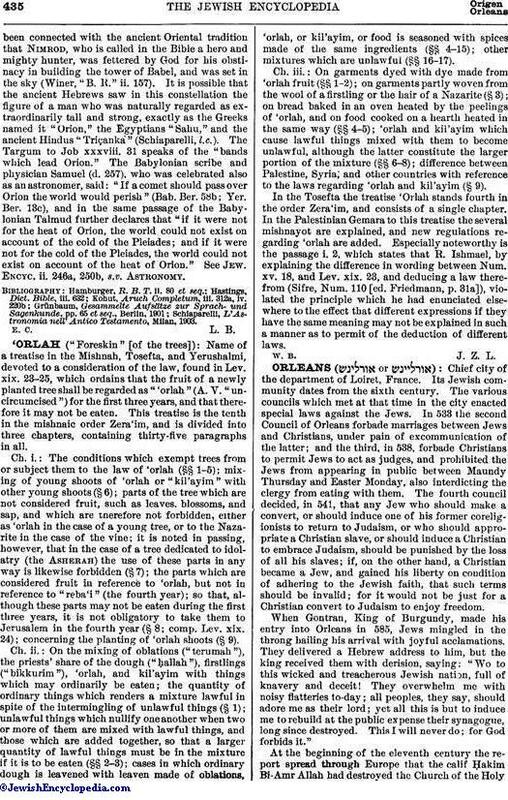 13c), and in the same passage of the Babylonian Talmud further declares that "if it were not for the heat of Orion, the world could not exist on account of the cold of the Pleiades, and if it were not for the cold of the Pleiades, the world could not exist on account of the heat of Orion." See Jew. Encyc. ii. 246a, 250b, s.v. Astronomy. Schiaparelli, L'Astronomia nell' Antico Testamento, Milan, 1903.